Get to know this flagship program whose delegates - which have included hundreds of fellows with disabilities since its launch - are creating more inclusive societies in Africa and the world. 1 year ago ago by Mobility International USA. The Mandela Washington Fellowship for Young African Leaders, which began in 2014, is the flagship program of the Young African Leaders Initiative (YALI) that empowers young people through academic coursework, leadership training, and networking. The Fellowship provides outstanding young leaders from Sub-Saharan Africa with the opportunity to hone their skills at a U.S. college or university with support for professional development after they return home. Fellows engage in Academic and Leadership Institutes, meet with U.S. federal, state, and local government officials, participate in community service, visit organizations to gain professional development, and make friendships and professional contacts with Americans. 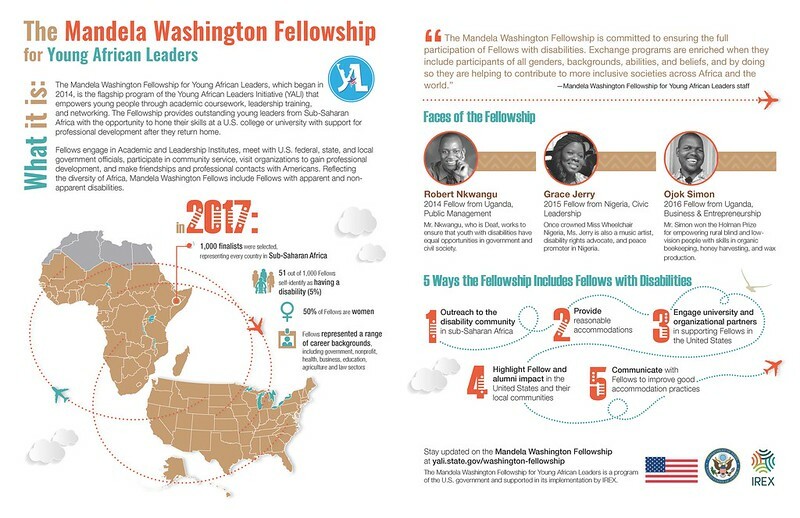 Reflecting the diversity of Africa, Mandela Washington Fellows include Fellows with apparent and non-apparent disabilities. "The Mandela Washington Fellowship is committed to ensuring the full participation of Fellows with disabilities. Exchange programs are enriched when they include participants of all genders, backgrounds, abilities, and beliefs, and by doing so they are helping to contribute to more inclusive societies across Africa and the world." Mr. Nkwangu, who is Deaf, works to ensure that youth with disabilities have equal opportunities in government and civil society. Once crowned Miss Wheelchair Nigeria, Ms. Jerry is also a music artist, disability rights advocate, and peace promoter in Nigeria. Mr. Simon won the Holman Prize for empowering rural blind and low-vision people with skills in organic beekeeping, honey harvesting, and wax production. Stay updated on the Mandela Washington Fellowship. The Mandela Washington Fellowship for Young African Leaders is a program of the U.S. government and supported in its implementation by IREX.